We feel secure and safe in our vehicle, but sitting in a vehicle places us at a tactical disadvantage. So we must be especially vigilant. Each year in the United States, there are approximately 38,000 reported carjackings. If you are one of these unfortunate targets, it is important to know that 75% of the time, the bad guy uses a weapon. These numbers coupled with the fact that sitting in a vehicle places you at a tactical disadvantage means we are particularly vulnerable while in our vehicles. We also must be extra vigilant and look for indicators that a criminal may have us in their sights. 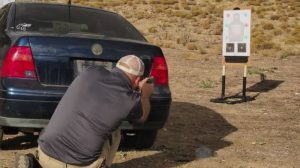 Additionally, as concealed carriers, and the protectors of our family, we ought to understand the dynamics of gunfighting from inside a vehicle. Recently, I wrote an article describing my personal story of being carjacked as a youth. In it, I explained not only what happened, but lessons I learned. Lessons that I applied while working as a patrol cop, and in my everyday life. These crimes happen quickly and are violent. I learned a lot from my first-hand experience, but thank God there are other ways we can better prepare ourselves to avoid or fight against carjackers without being involved in one. I have included a carjacking incident that was caught on video. We can learn much by watching this short video clip. This incident takes place at noon in a Detroit gas station. 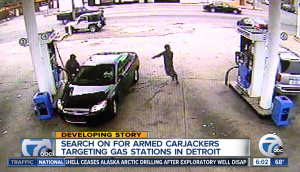 These two carjacking suspects work in tandem to ‘ambush' the driver who is stopped at the gas station. One armed suspect approached on the driver's side while the other rushes the passenger side of the vehicle. Even though most criminals do not possess tactical skills, notice that these two show a coordinated attack. Pay attention to how the two rush the vehicle quickly while hiding in the vehicle's blind spot. This allows them to get very close before being detected. They catch the driver completely off guard. Once the driver's door has opened the carjacker is in a distinct position of advantage. Ultimately the driver flees, and the two suspects leave the scene in their newly acquired vehicle. It is important to note that these two committed a series of these carjackings before being caught. This makes sense and confirms how the two perfected their tactics. First, this underscores the importance of being alert at all times and in all places. This incident happened in a well-populated area during the middle of the day. We also see how the car puts us at a tactical disadvantage by obstructing our field of view. Keep your doors locked until you have to exit the vehicle and lock them immediately when you re-enter. This places a physical barrier between you and a would-be carjacker. Bullets go through glass and sheet metal, but knives, fists and other blunt objects usually don't. This will buy you some time against carjackers armed with these types of weapons. Now the problem of someone opening your door and getting the drop on you is reduced. And yes, carjackers could very well shoot through the door. However, this is not typically the outcome. Carjackers and criminals in general first use the gun to intimidate. That is not to say they will not shoot, but shooting through a car door to steal a car, is more work and a higher risk to the carjacker. The locked door is more likely to give you enough time to drive away from the scene and make the suspect move to softer target. Have you practiced your draw while seated in a vehicle? You absolutely should. Seatbelts are essential, but a tactical nightmare. I always remove my seatbelt as soon as I am stopped and only put it on when my vehicle has started and I am ready to leave. This gives me the freedom to bail from the vehicle and get to my gun easier if I happen to be carjacked. Carjackings are one thing, but in an ambush where the attackers are shooting into the vehicle, you have a couple options. Drive from the scene, if you can, or fight. Fighting from inside a vehicle, especially while being seatbelted in, is not wise. Think about how you carry your firearm while in your car. Is it accessible? Is it in a visible area that the carjacker could see, taking away your element of surprise and your ability to chose the best moment to respond? Think about if your firearm was in a car-mounted holster, how you would get it if that carjacker was pulling you out of the vehicle? In this specific scenario, the attackers had the drop on the driver. This is the reality of defensive shooting. We respond to threats. So we try and give ourselves distance so we have time to appropriately respond, but often we simply cannot. If we are conducting continuing training with multiple targets, they are often in the same general area or direction. Look at how this played out. Coordinated efforts by thugs may not be the norm, but they are not unheard of. This attack from different direction diverts our focus and makes it a much more complex problem to address. Let's say the victim had been armed, could he have drawn his firearm, and engaged both suspects before being shot by one of them? Probably not. Drawing your firearm on a weapon that is already presented is usually a losing proposition. Unless the concealed carrier can wait for the right opportunity. Carrying your firearm concealed on your body at least gives you the element of surprise and the chance to pick your time to engage. Gunfights in and around vehicles require special considerations. This did not factor into this incident, but vehicle positioning is important. Whenever stopped in traffic, you should try and leave yourself an avenue of escape should someone approach your vehicle. Gunfighting is fine if needed, but avoiding a gunfight is better. If you can escape the carjacking or ambush, you should. Along the same lines as avoidance, awareness of your surroundings is paramount. If you are stopped in traffic, paying attention to people around your vehicle will provide you the ability to identify an attack before it happens. And, if you have an avenue of escape, you can hit the gas and go. Whenever stopped, continually scan your mirrors and blind spots for people who are near. Lastly, do some vehicle-specific training. I know not all of us can get to a tactical class dedicated to vehicle tactics. But try and find a range where you can do a little more than stand at a bench and shoot a stationary target. Then try and work some retention shooting to your training. Shooting from unorthodox positions is much harder than most would have you believe. Do what you can to mitigate the disadvantages that come from being seated in your vehicle. Train you mind and build the skills to give you a better chance at surviving a carjacking. Shooting from a seated position is something that most don't get to practice. No vehicle to shoot out of, no worries. Just placing a chair on the line is the next best thing. Drawing and presenting from different angles will give you the understanding of the unique challenges of shooting from a compressed position. As always, whenever learning a new technique, learn the technique with an unloaded firearm. Practice the drill until you can perform it safely, before going live. And lastly, while we are talking about dry-firing, practice drawing while seated in your vehicle. Just like you practice drawing from a standing position, train that draw stroke to be smooth even while in your vehicle. You can never have too many reps of a good draw stroke. To learn more, check it out here. As always stay alert, be safe and God bless. I tried some of this a couple weeks ago. Anyone know how to get powder burns off car paint? Great couple of articles Matt. I live in St. Louis, MO and next to home invasions, being assaulted in my vehicle is my next highest concern. Ever since 2014, and the Michael Brown incident, the thought of turning a corner and being in the middle of an angry mob is an ever-present danger and why, after 4 years, I decided to actually use my CC permit which led me to IDPA competitions. The IDPA or International Defensive Pistol Assn. has scenario based courses of fire that are geared to the concealed carrier and home defense. The rules are the same worldwide as are the range commands in english. All you need to start is your gun, OWB holster, 3 mags and safety gear. Many ranges, indoors and out, host club matches every month. If you are interested in getting started go to IDPA.com.